A busload of Freedom Riders arrive in Montgomery, Ala., under the protection of police and National Guardsmen, May 24, 1961. On May 21, 1961, an interracial protest against segregration, the Freedom Ride, incited violent mobs and roused a sleepy government into action. Although segregation on public buses was twice banned—under Browder v. Gayle in 1956, and Boyton v. Virginia in 1960—the Supreme Court rulings continued to be ignored, especially in the Deep South. Consequently, the Congress of Racial Equality planned a peaceful demonstration by black and white volunteers known as the “Freedom Ride.” Knowing their actions would incite a crisis situation, activists hoped to force the government into action. Participants planned to ride in two buses from Washington, D.C., into Alabama and Georgia—both areas of powerful resistance. The groups hoped to reach New Orleans by May 17 to celebrate the anniversary of Brown v. Board of Education. In a Teacher’s Domain video interview, James Farmer, the lead CORE organizer, explained that blacks and whites would swap seats, with blacks sitting in the front, and that they would also attempt to integrate rest stop bathrooms and waiting rooms. On May 4, at 11:00 a.m., the first of the two buses left Washington, D.C. The first bus, a Greyhound, carried seven freedom riders, including the group’s leader, Joe Perkins. There were also two undercover corporals, Ell Cowling and Harry Sims, who had been sent by Floyd Mann, the Alabama Highway Patrol manager, under the direction of Gov. John Patterson, to find out the group’s agenda. The first assault happened in Rock Hill, S.C., but more serious trouble waited for them in Alabama. As they entered Anniston, Ala., a group of about 50 people, many of them Klansmen, surrounded the vehicle. Although the driver may have welcomed the mob, the undercover agents rushed to block the bus’s doors. The crowd hurled rocks and brass knuckles through the bus windows and slashed its tires. After some time the police arrived. However as historian Raymond Arsenault revealed to NPR, they made no arrests and escorted the bus onto the main road, though brought it only as far as the city line. Eventually the police came and the wounded were taken to the hospital, where many of the blacks were refused treatment. Fred Shuttlesworth, who had earlier warned CORE leaders of trouble, sent several cars of gun-wielding pastors to retrieve the wounded from the hospital—the men had broken their promise to Shuttlesworth not to carry weapons. With weapons in view, they led the Freedom Riders past the same mob just outside. Forced to end their journey, the original Freedom Riders flew to New Orleans. Other activists from Nashville’s Student Nonviolent Coordinating Committee, SNCC, led by Dian Nash, replaced them. These activists were the same students who had actively tried to desegregate southern lunch counters the previous year. On May 17, Police Chief “Bull” O’Connor arrested the Freedom Riders then drove them back to Tennessee’s border, but they returned to the bus terminal singing their freedom songs. This time ,when they reached Montgomery, “men, women and children carrying baseball bats, tire irons and bricks met them at the terminal,” reported Time. Several riders, including Jim Zwerg and John Lewis, were beaten unconscious. Once they reached Jackson the activists were arrested and fined $200. Riders who rejected the fine were given a 90-day jail sentence; a few hundred riders would be arrested. Ultimately, Patterson, who had been voted into office with the support of the Ku Klux Klan, was forced to bend to the demands of President John F. Kennedy and his brother Robert Kennedy, who was the attorney general. In the early morning hours, he called on the National Guard to protect those inside the church. On Sept. 23 the riders prevailed; Robert Kennedy introduced new legislation to ban “discrimination in interstate travel,” which was made official Dec. 1, 1961. 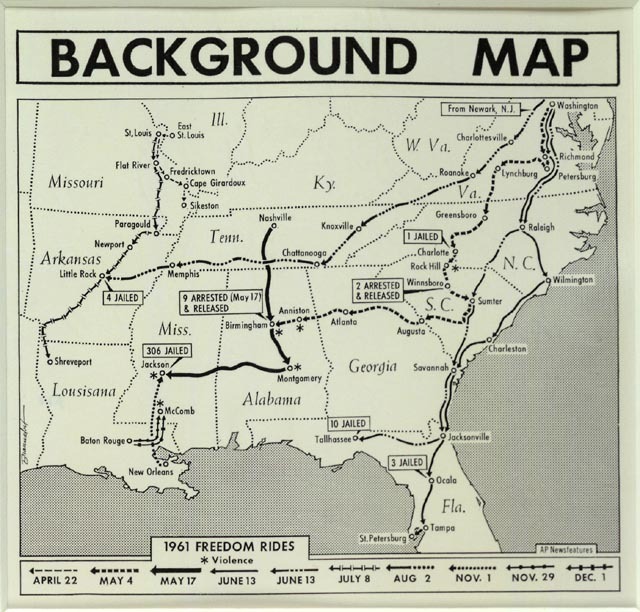 The Library of Congress offers a background map illustrating the route of each freedom ride that occurred, and the location of various assaults. PBS’ “The Rise and Fall of Jim Crow” examines the history of the laws of segregation that existed in the South from the end of the Civil War to the end of the Civil Rights Movement.